This may have been how Andy Travis felt after traveling up and down the dial and landing at WKRP in Cincinnati. 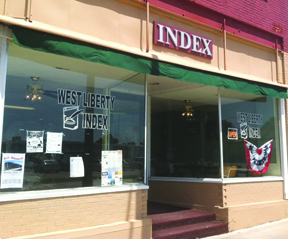 After working 23 years at eight daily newspapers, I have found myself at the West Liberty Index. It is a roughly 1,500-circulation weekly newspaper in West Liberty, a Muscatine County town of about 3,700 people. Among other things, West Liberty is known for being the first town in Iowa where Hispanic residents comprise the majority of the population. As soon as I figure out what I’m supposed to be doing, I will take over for Editor Geoff Rands. The plan is I will help put out a paper every week while the owners search for a permanent editor. I will likely be at the Index until they hire someone or I find a more permanent gig for myself, whichever happens first. This may impact how on often I post items here. But it should also give me some new stuff to write about in the days and weeks to come. If you are a Muscatine friend who finds yourself in West Liberty, stop in and say hello. If you are an Index reader who happens to find this blog, I hope you will stop in and introduce yourself. ← Picking up and carrying an 80-lb sandbag? Yeah, I can do that. Was beginning to think WCF was taking all your time from blogging. I bet once you get there they will see how awesome you are and they won’t let you go! Glad to see you have this going. Good luck! The West Liberty Index is, indeed, lucky to have you! Thank you, Linda. Have to admit I like the pace of things here. And everyone I’ve met has been unbelievably nice. I just need to learn how to work on a Mac.